My hero has never worn a jersey and played for my favorite football team. My hero has never played a guitar or sung to a crowd of thousands. My hero has never acted in an Oscar winning movie. My hero has never held political office. My hero has never worn a white lab coat or gone to medical school. My hero was born with all odds stacked against her. My hero had five surgeries in her first two years of life, with more to come. My hero had to learn what real pain is all too early. My hero pushes past the pain to do her job well. Her business is laughing, learning, playing and growing. My hero has taught me more than any teacher in any classroom ever could. My hero is the toughest person I know. My hero loves easily and fiercely. My hero has no idea she is different than anyone else. WARNING: RANT ALERT! RANT ALERT! RUN FOR COVER! I am still livid and I have had a couple of hours to calm down. We took Marissa in to get her g-tube changed out today. A little backstory first: Marissa has had a Bard brand g-tube button since she got her gastrostomy in May '07. The Bard brand button is a low profile (flush with the skin) more permanent device. You have to go to a clinic and get it changed out by a nurse. It is very painful to the kiddo to have it changed but it really only needs to be changed every 1 to 1 1/2 years. Marissa had hers changed out last in May of '08, so it was past time to change it again. Plus, the last few weeks, the device has started failing. It has been leaking a lot and causing her stomach acid to leak out and burn her skin. Not good. We decided to have it changed out and, at the same time, change brands to the AMT MiniOne Balloon button. This button is also low profile but the feeding extensions lock in place so the kiddo can't just yank on the tube and *GUSH*, out pours all the feeding that is supposed to be going into her stomach. We have been having some issues lately with Marissa yanking her night feeding out while she is supposed to be going to sleep. She does this on purpose so we will come running in there and pay attention to her. She does not understand that when she does that, we have to change her clothes, change her bedding, give her a bath and put her back in bed. Nor does she care. UGH! This new button is held in place by a water balloon and can be changed out at home with no pain involved. Yay! I called the surgical clinic two weeks ago to set up an appointment to have the button changed out and the new supplies ordered. I spoke directly with Nurse L who would be changing the button out. We love Nurse L, by the way, and this rant is not related to her whatsoever. We need spare buttons and feeding extensions. The button is no good if you don't have the right tube to hook into it to feed the kid. Since Marissa gets NONE of her nutrition by mouth, this step is pretty important. I actually had two buttons with two bolus feeding devices that my friend Janay, Milo's mom, gave me a while back. We just needed the 90 degree feeding extensions and back up buttons. Nurse L faxed an order to our lovely (NOT!!) DME company, CrApria (whom this rant is VERY MUCH about!) On the 18th of January, 10 days ago. She has faxed hundreds of orders hundreds of times to CrApria and other DMEs over her tenure as a nurse at this clinic. She knows how to get this done. I asked Jeremy to join me at the appointment today since I would have my hands full with a hysterical Marissa and we would need to have a little lesson on how this new device works. Boy am I glad he came with me and Marissa today. I got to the clinic and as soon as I opened the door to get Marissa out of the car, she started crying, coughing, gagging and trying to throw up. This girl is too anxious for her own good! Thank God she had not had anything to eat in several hours or we would have both been covered in throw up! I got into the clinic and was checking in when Jeremy showed up, thank God, because Marissa was non-stop crying and I could do nothing to console her. We got called back to the room and Nurse L came in and told us that we would need to reschedule for another time because CrApria did not send the order. WHAT?!?!?! No friggin' way am I doing this all again and have Jeremy's sacrificing time at work and Marissa's super anxiety all be for nothing today. No friggin' way!! Nurse L got on the phone with CrApria and I got on the phone with the local branch. If nothing else, I wanted to go to the branch and pick up the proper extensions myself. Well, that was a no go because the button we switched to is a "special order" and CrApria does not keep any buttons or extensions in stock, they order them directly from the manufacturer and it will take 7-10 business days to get them. GRRRR! Nurse L came back in to explain the situation to us. Come to find out, CrApria changed their fax number and, while the number Nurse L originally faxed the order to was still a valid CrApria fax number, it no longer went to the enteral department. So the enteral department never got the order! Now, why someone didn't see that the fax was in the wrong place and take the small amount of time it would take to get it to the right place, is beyond me. Even people who are collecting a paycheck for the work they do can be so lazy and inconsiderate. Some people have a syndrome called NMJ ~ Not My Job. If they weren't specifically told to do something by their supervisor or job description, even if it is the decent, considerate thing to do, you can bet they won't do it, just because it isn't their job! I told Nurse L that we were not leaving without getting Marissa's button changed. First, the current one was leaking stomach acid and burning her. Second, I just knew that it would completely fail sometime very soon and I was not willing to have to go to the ER some night in the next 7-10 business days because it came out and we have no way of putting one back in, while we wait for CrApria to pull their heads out of their $#@! I was speaking to Nurse L while I was on hold with CrApria. The lady came back on the phone and reminded me that, if I have the bolus extension, which I have two, that we can still feed her. It will lock in place, but because it sticks straight up, it will not be very comfortable during Marissa's night feeding because she LOVES to sleep on her stomach. But it is doable. Just then, I had a revelation. I hung up with the lady from CrApria and called my friend Janay. I briefly explained the situation to her and she told me she could overnight me some feeding extensions! God bless her, she saved my sanity!!! She just texted me and let me know I would have the extensions in my hot little hand by noon tomorrow. Thanks Janay, I owe you big time! So, knowing that we could feed Marissa over the next 24 hours with the bolus extension, we went ahead and changed her button out for the new kind. It will probably be a long night of the feeding pump alarm going off because Marissa is crimping the line by laying on her stomach but we will manage. Marissa was a trooper, by the way, and we gave her Tylenol to help with the pain. Poor baby passed out when I got her into her bed and is still asleep as I am typing this. I hate that she has to learn to be so tough, so young. I will never take for granted all she has been through just to be here. She is my hero. So, I will have the extensions Janay sent me tomorrow and I called CrApria back to confirm they got the order and are placing the order for the supplies I need today. We'll see if they get it right. I highly doubt they will. I am not exaggerating, in the 2 1/2 years we have been dealing with CrApria, they have gotten one order right. Only one. Just one. And technically, they even screwed that one up but I forgave them for it because the error was in my favor. They sent me six cases of sterile water instead of the two I ordered. Ha! That is the closest they have ever gotten to getting any of my orders right. Ever. I am so sick of them I could scream. It is not like I am calling Kohl's and ordering a blue sweater and they either sent me a red sweater or dropped the order all together. These aren't leisure items I am ordering. These are medical supplies and equipment that my daughter depends on to KEEP HER ALIVE! CrApria should really be ashamed of themselves and how they treat their customers. Pardon me, patients. I know of so many others (many of you will comment in the affirmative, I am sure) who go through this same thing, over and over and over with CrApria. Otherwise, I would think they were just picking on me! But this is nationwide ignorance, incompetence, and complacence! Nurse L filed a complaint and I am going to also. 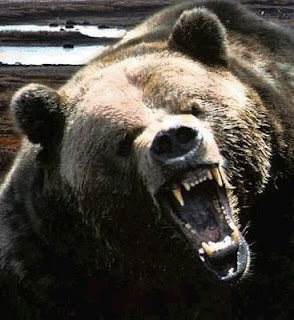 CrApria will be made aware that you don't F*** with Mama Bear! Thanks for letting me rant, friends. I feel much better! I heard a song on the radio a while back that made me stop and really listen. It is by a band called Sick Puppies (yes, go ahead and chuckle...) and it is called "Odd One". The lyrics just spoke to me. I looked on the internet to see if I could find out more about this song and the meaning behind it. I couldn't find any information on it but in general, it is clear that the song writer is speaking of someone who doesn't fit in with society's perception of "normal". Personally, I picture the song writer singing to a person in his life with a physical, mental or intellectual disability. Just for clarification, I do not see the song writer's use of the term "Odd One" as derogatory. If you listen to the whole song and pay attention to all the lyrics, you might see it as I do. I believe the song writer uses the words "Odd One" as a term of endearment. Feel free to disagree with me once you have heard the song but please listen to it with an open mind. Be sure to listen all the way through, one of the best lines of the song comes right at the end. First, I was able to get Marissa's hip X-ray order without having to go back into the doc's office. Let's just say I am really impressed with her new pediatrician. He did not get the message about us leaving his office without an order until Friday morning. But, when he called me Friday, he let me know that he woke up in the middle of the night with the thought that we never finished talking about Marissa's hip issue. Don't get me wrong, I felt bad for the guy. But to me, that just shows how dedicated this doctor is to his patients. This was his first time meeting Marissa and he woke up in the middle of the night thinking about something he had missed in his appointment with her! WOW! I think he is a keeper! Jeremy and I took her in for the X-ray on Monday when he was off work. Things always go much smoother when Jeremy is able to go with me to appointments. As usual, she threatened to throw up several times, snuggled on my shoulder (which I don't mind at all! ), and cried the whole way through the X-rays. She even cried "Owie!" a couple of times, even though there were absolutely no owies. Poor traumatized thing! I wonder if she is ever going to be even alittle relaxed in a doctor's office or if we have emotionally scarred her for life! Well, her ped's office called back this afternoon and said the X-ray shows some hip dysplasia and they want her to see an orthopedic surgeon. They gave me the name and number of a ortho who works with kids and has a passion for special needs kids. Perfect! We love those kinds of docs! I called her office and the receptionist said they could get us in tomorrow morning at 8:15! I said "wow, I didn't think we would be seen that soon!" and the lady said "It's important we try to get hip appointments in quickly. Hip problems are not good." Well that's great and all but now I am really freaked out! So, I would really appreciate your prayers for my Li'l Punkin tomorrow. In the very least, I have to deal with a very upset, crying, and trying to puke Rissa. In the worst, we are going to be told she needs surgery. I don't know what I'll do if that is the case. I'll update tomorrow when I know something. Thanks friends! We just got back from the appointment with the ortho. First, there was no mention of surgery, thank God! The doc had Marissa lay down on the table and try to demonstrate how her hip pops. Marissa knew just what to do when we asked her to pop her hip and the doc was able to feel and see it. She said that based on the exam and the X-rays, Marissa does have mild hip displaysia. She wants her back in physical therapy and she gave us a script for a shoe insert called Pattibobs. We picked those up, to the tune of $70 (insurance does not cover). She wants a repeat X-ray and an office visit in six months. That's it! Overall, a good visit. Marissa did throw up the tiniest bit as I was standing at the desk checking us in. We hadn't even been in the doors for 10 seconds before she started freaking out! Oh well, I'm just thankful the appointment went so well! Between Facebook and this blog we got 33 comments for Haiti!! You guys rock, thank you so much for participating! I had a lot of fun watching the comments roll in and finding a few new blog friends in the process. So it looks like The Red Cross is going to get $33 from our family on behalf of all our wonderful friends! WooooHoooo!! Jeremy and I were touched by one commenter who said we should consider donating to a smaller charity, as they struggle with collecting donations more than the larger, more well known ones. We decided to donate another $33 to a wonderful charity named God's Littlest Angels. I actually first heard of this organization on Wednesday morning on the Today show. They had an interview with Dixie Bickel, the director of the orphanage in Haiti. I went back and watched the video (click the link on the top right side of the GLA website) and Dixie said something that really struck me toward the end of the interview. Even though her orphanage is still standing and all the children got out safely, she said the number of new orphans from this tragedy will increase significantly. She also said that many of the homes of the orphanage workers were destroyed so they will be needing to rebuild. They are going to need our help now more than ever. I know you guys are generous souls and if you have not already donated to the Haiti relief efforts, please consider donating to this wonderful organization and to the precious children who are now orphans as a result of the earthquake. My mom reminded me of a great charity called UMCOR or United Methodist Committee on Relief. Being the daughter of a retired Methodist minister, I remember certain Sunday mornings in church that were dedicated to raising money for this great charity. The cool thing is that 100% of every dollar is used for the specific program you decide to give to. So we are giving another $33 to UMCOR and 100% of our $33 will go to relief efforts in Haiti. The UMCOR family has been hit hard by the earthquake in Haiti. Two UMCOR executives were killed when the Hotel Montana collapsed. They were in Haiti meeting with colleagues from other agencies to plan improved health services there when the earthquake struck. My heart is saddened by this news and yet I am uplifted knowing that these two men died doing good for others. Thank you once again, sweet friends, for participating and making this a fun way for us to decide how to help our brothers and sisters in Haiti. Thank you, thank you, thank you and God bless! Hey y'all! I have seen a few big name bloggers do this and I thought I would give it a shot. By no means do I think I am a big name blogger, in fact just the opposite. But I thought it would be a fun way to raise money for a good cause and help out our brothers and sisters in Haiti. Spit it out already, you say? For every comment I get on this post, here on the blog and on Facebook, Jeremy and I will donate $1 to either the Red Cross, Compassion International, or Samaritan's Purse. Only one comment per person, please. And you must comment no later than 10:00 PM, Colorado time, Sunday, January 17, 2010. Please comment and also vote on which of the three organizations I just listed we should donate to. The organization with the most votes wins! I am hoping this will bring any lurkers I may have out of hiding. And, just in case I only get 14 or 15 comments between the blog and Facebook combined, Jeremy and I reserve the right to decide to double or triple the amount as we see fit. All I need from you is a comment on this post. Pretty easy, right? I will update Monday with the results. So c'mon peeps! Let's reach out to Haiti in a tangible way! They definitely need your prayers but they also need monetary assistance. Update: The appointment actually went better than I expected. Tons of crying, plenty of threats to throw up but she never did. I'm sure this is in large part due to the fact that she had already digested her breakfast formula and did not have much to throw up but water, but it sure wasn't for lack of trying! The new doctor and his staff are great! He gave us a referral to see a nutritionist, so I will be calling to set up an appointment tomorrow. The only problem we had is, I mentioned to his MA and to the doc himself about her hip. Since it was the first visit, there was a lot of medical history to get through. By the end of the appointment, we had both forgotten it and we left without him letting us know what he thought we should do. I called back as soon as I got home, and spoke to a nurse who at first told me that he would want to see her for it. I explained we were JUST in there and he did examine her, I just left without an order for an x-ray or an ultrasound. She said she would have him call me and I am still waiting for him to do so. Please, PLEASE, P-L-E-A-S-E do not make me bring her BACK in just to get an order! Ugh. Marissa was actually very sweet and laid her head on my shoulder the entire time I was talking to the doc. She never sits still and cuddles with me unless she is sick or feels threatened, I guess. She would not take her eyes off him the whole time. It was kind of cute. By the time we got back to the car, I could tell she was pretty pooped. It was two hours past her normal nap time but when I got her home, I took her up to bed and she zonked out pretty quickly. A short nap is better than no nap! Today is going to be a challenge, that's for sure. First, Jeremy has a big presentation at work. He will be presenting to about 100 people (he feels your pain, Michelle!). Second, I have to take Marissa to meet her new pediatrician. Since the appointment is at 11:30, she will most likely be skipping her nap. Ugh. She also has EXTREME high anxiety about doctor's offices. She cries, coughs, gags, and makes herself throw up on most occasions. No amount of coaxing, back rubbing, holding, hugging or kissing by me ever makes any difference. She doesn't trust me because I am the one who brought her to this awful place of torture in the first place. Since this is her first appointment with this doctor, he is going to do a full physical. This is going to send her over the edge. I am going to raise a couple of concerns that Jeremy and I have about Marissa. First, she has been popping her left hip out of socket for a couple of weeks now. She is already at risk for hip displasia because she was frank breech in the womb. She passed a hip ultrasound before she was discharged from the NICU but the doctors said this could be a problem that might come up at any time in the future. Please pray that it is an easy fix. We are also trying to see if there is a way we can help her gain weight. To be a good candidate for the reconstructive surgery she will need to get her trach out, the bigger she is, the better. She has been holding steady at 27.5 lbs for a long time now. We need to do something to pack the pounds on this girl! Please pray that I can keep it together today. 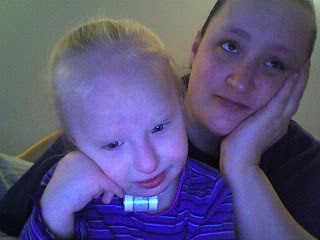 It is so hard on this Mama's heart to know how terrified of doctors my girl is. "No, in all these things we are more than conquerors through Him who loved us." Romans 8:37. "I can do all things through Christ who strengthens me" Phi. 4:13. Today, remember that whatever task or challenge lies before you, you can overcome and conquer THROUGH HIM!!! Don't attempt to walk on your own - seek the One who will overcome!!!" Yes, that is a Band - Aid on her nose. She got a scratch on her nose and would not leave it alone to heal. She is a scab picker. Ugh. But she is still, and always will be, my Sunshine! A comment my Mom (Nana) made on my last post got me thinking about a great song by Brad Paisley called "The World". We listen to this song all the time around here, it is one of Marissa's favorites. I can't explain it. It shouldn't mean as much as when she started walking, or when she was able to use her PMV, giving her a voice. But it does. It means as much, if not more. It makes my heart soar every time I hear her utter the word. Marissa is finally saying "Daddy" correctly. This was after being able to use her speaking valve for only about 3 months! She would only say this when she was looking at her Daddy or sitting in his lap, so we knew it wasn't just babbling. She even wowed her geneticist two months later when she said "Da Da" as she climbed into his lap. But somewhere along the way, she forgot that she knew how to say her d's. While she was babbling, she would pronounce the "d" sound but when asked to say a word with a "d" in it, she pronounced it as a "y" instead. So "Da Da" became "Ya Ya" and then morphed into "Ya Yee". We were only slightly concerned, as her speech therapist said that some kids do this, for some unknown reason. It was not exactly a regression, more like a temporary blip. Her therapist had confidence that her d's would come back, so Jeremy and I felt we had to have confidence as well. She called Jeremy "Ya Yee" for the longest time. Until the beginning of last week. It started out as "Da Yee". Jeremy and I looked at each other in amazement when we first heard her say it. I wanted to cry. I was overjoyed at just this small amount of progress with just this one little word. Then, by the end of last week, she was saying the full word, "Daddy"! Now she says it all the time, with great love and gusto. Like I said, my heart soars every time I hear her say it. What a cute, wonderful, precious little teacher Marissa is. It is like I was blind to the world before she came along and now I see everything more clearly; especially things others may brush aside as ordinary, typical, or no big deal, as I had for so many years. She has taught me to appreciate the small things.